With its breathtaking coastal scenery, magnificent forests, abundant wildlife and sheer diversity of landscape, the Great Ocean Walk bears the mantle of being one of Australia’s most iconic walks. Walk the 104km Great Ocean Walk track from end to end as it meanders its way through manna gums with koalas only a few steps away, to traversing massive sea cliffs that have made this location famous. Step through giant Mountain Ash forest, beneath the tallest flowering plants in the world, and along some of the most pristine beaches in Australia. 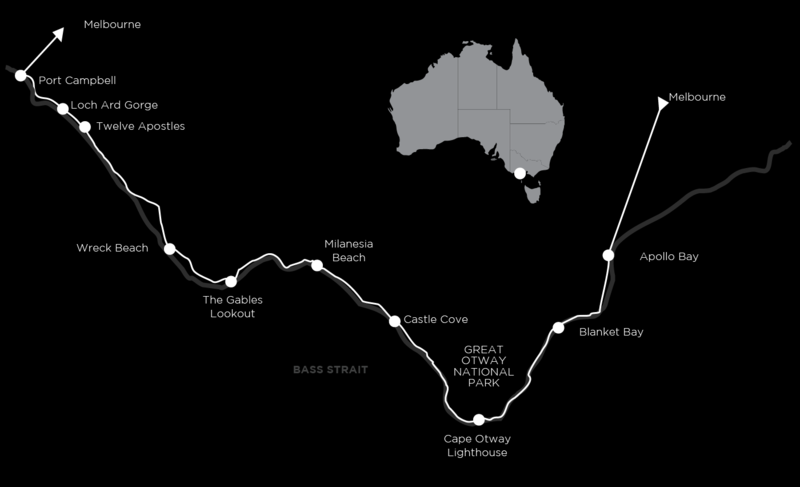 Highlights of the Great Ocean Walk include the Twelve Apostles, plus more stunning views as you progress along the track at Castle Cove and at The Gables, as well as Wreck and Johanna beaches. The pristine nature and deafening surf make Johanna Beach one of the ultimate beach walks. A local indigenous guide will walk with us on a section of the walk to share stories and information on the local culture and traditions. A local shipwreck historian will also give incredible insight into the local shipwreck history. One of the most fascinating stops along the Great Ocean Walk is the geological formations and shipwreck of Loch Ard Gorge. We move you along the coast shortening the travel time staying in excellent accommodation as we go. We take care of every last detail and with 2 expert and very experienced guides looking after you, you can pace yourself and if you feel like it shorten the walking if you prefer. We will depart Melbourne at 7.15 -7.30am from pick up at Melbourne Arts Centre, St Kilda Rd, Melbourne. Travel on the Great Ocean Road to Apollo Bay with regular stops to other places like Lorne, taking in this magnificent area. In the afternoon, we’ll leave the tourists behind as we walk along the coast away from Apollo Bay. Observe the colony of fur seals that frequent Marengo Reef Marine Sanctuary. The track hugs the coast at first before heading inland through tall eucalypt forest and patches of rainforest to Shelly Beach. Walk down to Elliot river admiring the crashing waves as the river exits into the sea. Meander through delightful mountain ash forest to Blanket Bay, then through coastal forests and along the cliff tops to Parker Inlet – a postcard setting and one of our favourites and the original anchorage for dropping off supplies in this area. An optional side-trip to Crayfish Bay is an added highlight. The Mountain Ash trees through here are some of the biggest trees in Australia, making for superb walking. Continue through manna gum forests that are home to large numbers of koalas, emerging at Cape Otway Lightstation. In the morning we take a tour of the lighthouse with the local shipwreck historian. We then walk out of the lighthouse to Station Beach, and an optional short return hike to the scenic Rainbow Falls where a natural spring cascades down to the rocky coastal platforms below. The track continues through the wind-sculpted sand dunes and along the cliff-tops to the Aire River estuary and surrounding wetlands. After stopping for lunch at Aire River we will continue on to Castle Cove where you will be treated to stunning coastal scenery on the route. The views at our final destination of Castle Cove are some of the best on the track. Meals: Your guides will be out to impress with this morning’s breakfast and lunch spread. A showcase of their culinary skills, as well as the option to build your own lunch for the day, will be the perfect start. 2-course dinner. Today’s the hardest day of all the walks but the most satisfying as the views and diversity of terrain are outstanding. Walk steadily down from the gate to Milanesia Beach, a bit of a secret that not many people get to see, making it all the more special. From here, the track continues along the cliff tops looking all the way back to Cape Otway lighthouse. High sea cliffs, breathtaking views and coastal forests lead to Moonlight Head. Our next stop is Gables Lookout, perched on top one of the highest sea cliffs in mainland Australia. It’s then another beautiful gentle forest walk finishing atop the cliffs at Wreck Beach. Meals: An early breakfast will be served at a local cafe before collecting our lunches. A celebratory quintessential Australian 2 course meal at a locally loved restaurant for dinner. Meals: Same arrangements for breakfast and lunch. A quick bite to eat in Colac on the way home. The track is very well graded and relatively easy to negotiate. Full days walks average about 17km. There are great opportunities for fit walkers to challenge themselves with options to increase the walking and on least two of the days where we walk over 20km. Comfortable ensuited rooms for three nights in cottages at Cape Otway. The last two nights are spent at Port Campbell in twin share private rooms with ensuites. Limited single rooms are available. Please speak to the office. Healthy and delicious restaurant food will be provided for breakfast, lunch and dinner, including chef prepared dinners. Our guides take great care to ensure that our walkers are always well fed and hydrated throughout the day. The trip starts and finishes in Melbourne. Most walks range from 18-22 km on well-formed tracks with a few short beach sections. Whilst the walking is mainly easy to moderate, there are a few steep hills making it tiring in some places. Those that want to walk the whole track will be able to do so. This trip operates with two professional guides ensuring that you have both a safe and enjoyable walking holiday. Knowledgeable of the region and specific area, they can offer easier and harder walk options along the way. Please contact the office if you need further advice, or if you wish you can to speak with one of our guides. There are many good hotels in central Melbourne to choose from that are in close proximity to our pick up location the National Gallery of Victoria (NGV) on St Kilda Rd Melbourne. With an early departure of 7:30am (we request you be there by 7.15am) it would be beneficial to stay close to here. We arrive back in Melbourne at around 8.30pm on the last day dropping off at the NGV. For what to bring please refer to the Gear Advice on our FAQ section. We only offer this holiday during the very best periods to walk, autumn and spring, when daily temperatures are usually mild. It can sometimes still be quite warm, too hot on occasions but, as mentioned before, there is usually opportunity for a refreshing swim. See the Bureau of Meteorology for information about temperatures and rainfall ahead of time to ensure proper clothing.